Lean, juicy Boneless Chicken Breasts paired with easy, oven-ready Brussels Sprouts with Shallots and Bacon makes for a fantastic family feast no matter the occasion. Get our Chicken Breasts & Brussels Sprouts Dinner now for an unbelievable low price - even includes our decadent Chocolate Molten Lava Cakes for dessert! 4 count �|� 1 lb. Uncooked: For safety, must be cooked to an internal temperature of 165 � F as measured by use of a thermometer. Thaw in Refrigerator. Broil or Grill: Preheat broiler or grill. Cook for 3-4 minutes per side until internal temperature is 165�F. Contact Grill: Grill 3-4 minutes total on preheated contact grill or until an internal temperature of 165�F is reached. Oven: Preheat oven to 350 �F. Season as desired. 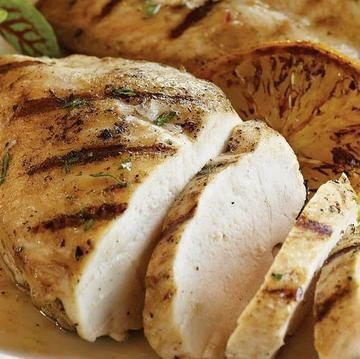 Place chicken breasts in greased baking dish. Bake for 20-25 minutes or until an internal temperature of 165�F is reached. Pan Saut�: Place 1 Tbsp. of cooking oil in a nonstick skillet over medium high heat. Add chicken breasts to pan. Cook for 4-6 minutes per side reducing heat to medium after flipping. Cook to an Internal temperature of 165�F. County of Origin: USA. Do Not Thaw! Stove Top: Separate Brussel Sprouts and place in a large pan over medium heat. Cook for 12-15 minutes stirring often. Oven: Preheat oven to 400�F. Carefully remove film from tray before baking. Place frozen tray on a foil lined baking sheet in the center of the oven. Cook for 35-40 minutes. Carefully remove from oven and serve. Microwave: cook on high for 4 minutes. Carefully remove film, stir and cook on high for 1-2 minutes. Stir and serve. Do not thaw. Microwave: Remove cake from plastic film. Turn upside down on a microwave-safe plate. Loosen cake from cup by applying pressure to center of cup with thumbs while holding the edges. Do not remove cup. Microwave on HIGH for 40-50 seconds. Carefully remove cup. Let stand 3-5 minutes before serving.Conventional Oven: Preheat oven to 400�F. Remove plastic film and place cake right side up, in its cup on a baking sheet. Heat for 15-18 minutes. Remove from oven. Let stand 3-5 minutes. Invert cake on serving plate and serve. Ingredients: Chicken. Omaha Steaks single ingredient poultry and domestic lamb is born, raised and harvested in the USA. These products are processed in our plants in Nebraska, USA after undergoing a strict series of quality checks and under the supervision of the United States of Agriculture. Ingredients: Brussel Sprouts, Shallots, Water, Bacon (Pork, Sea Salt, Raw Sugar, Spices), Butter (Pasteurized Cream), Corn Starch, Sea Salt, Black Pepper. Ingredients: Butter (Cream, Salt), Sugar, Eggs, Water, Bleached Enriched Wheat Flour (Benzoyl Peroxide, Chlorine, Niacin, Reduced Iron, Thiamine Mononitrate, Riboflavin, Folic Acid), Brown Sugar, Enriched Flour (Wheat Flour, Niacin, Reduced Iron, Thiamine Mononitrate, Riboflavin, Folic Acid), Semi-Sweet Chocolate (Sugar, Unsweetened Chocolate Processed With Alkali, Cocoa Butter, Milkfat, Soy Lecithin, Natural Vanilla Extract), Cocoa, Semi-Sweet Chocolate (Sugar, Unsweetened Chocolate, Cocoa Butter, Soy Lecithin, Natural Vanilla Extract), Cream (Cream, Milk, Skim Milk Powder, Mono-Diglycerides, Carrageenan, Cellulose Gum, Sodium Citrate), Baking Powder (Sodium Acid Pyrophosphate, Baking Soda, Food Starch, Calcium Sulfate, Monocalcium Phosphate), Natural Flavor, Salt, Modified Tapioca Starch, Soy Lecithin, Vegetable Oil Shortening (Palm And Modified Palm Oils), Guar Gum, Xanthan Gum. Contains: Wheat, Eggs, Milk, Soy. May Contain: Almonds, Pecans, Coconut. Manufactured In A Plant That Produces Nut Products. .